The Big ‘O’ was christened Roy Kelton Orbison, born in Vernon, Texas 1936 and sadly died, aged 52 in 1988. As a child Roy suffered from childhood illness which affected his eyesight and his poor vision required wear thick corrective lenses. Then this would almost certainly have prevented him from becoming a front man musician but the quality of his works and singing broke the “spec” barrier and the Big O achieved his childhood ambition of becoming a star. He grew up in Wink a small town in Texas and aged 13, had his first band, "The Wink Westerners" Under the guidance of Norman Petty, The Wink Westerners won a 30 minute weekly show on local radio. During this time Roy met Johnny Cash and was told about Sam Phillips and Sun Records. The band had a name change and became the Teen Kings. 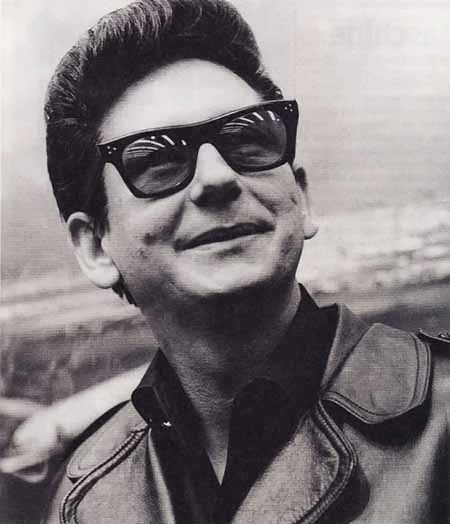 Roy Orbison achieved his first commercial success in June 1956 with "Ooby Dooby" (produced by Sam Phillips). Things moved slowly for the Young Orbison and he left Sun in 1957 and signed to music publishers Acuff-Rose then again in 1959. Fred Foster at Monument Records persuaded Roy to experiment with his voice (four-octave vocal range) and in particular the operatic end and write more songs (in collaboration with in collaboration with Joe Melson and later Bill Dees). From this collaboration came Only the lonely which rose immediately on release to the top of the charts (#2 in the US and #1 in the UK). In Britain, Only the Lonely remained in the Top 40 for nearly 6 months. This meant Roy had achieved success outside US and his management was keen to get him to tour Britain. In 1963 he headlined a European tour and good fortune allowed Roy and the emerging British groups scene to forge close and lifelong association. By chance the singer misplaced his prescription glasses on the plane flight over and with only dark prescription glasses up he popped on stage and the shades became a fashion statement and Roy’s trademark for the rest of his professional career. During the European leg of the tour Roy had befriended John Lennon and George Harrison and convinced them to come to America. When he brought out the follow up single in 1964 not only did it top the American charts for three weeks, but like its predecessor in the UK, it remained on the British charts for over four months. At the height of his fame Roy came to Australia in 1965 with the Rolling Stones. In the following years however Roy suffered several setbacks and family tragedies. A promised film career fell through, his hits began to dry up and as business had gone south his estranged wife Claudette, (heroine of the Everly's hit – penned by Roy), was killed in a motorcycle accident. Two years later in 1968, two of Roy's sons died in a house fire. Dejected the singer returned to his music routes and from 1973, recorded for Mercury and Asylum with moderate success in the US. Meantime his is reputation was growing throughout the world and Roy even took the top position on the Australian charts with “Working for the man”. A smoker, Roy experienced problems and in 1978 he had triple heart bypass surgery. Throughout the seventies more and more singers covered his songs. First Linda Ronstadt with Blue Bayou (1977), three years later Roy won a Grammy for his duet with Emmylou Harris (That Loving You Feeling Again) and a year later Don McLean scored with Crying, but real success came when he re-recorded his 1963 hit, “In Dreams” for the film Blue Velvet. The song came to the attention of a younger audience. Roy was working with Jeff Lynn in the early eighties and could not resist an invitation to join Bob Dylan, George Harrison, Jeff Lynne and Tom Petty to form the Travelling Wilburys. Hit albums followed and so Roy decided to kick start his career and re-recorded "Crying," as a duet with k.d. lang in 1987 for the soundtrack of the motion picture, "Hiding Out". The song earned the Grammy Award for Best Country Collaboration with Vocals. Back in the studio again and full of enthusiasm, 1988 saw Roy laying tracks for a new solo album and it was called Mystery Girl. Sadly it was posthumously released but is thought to contain arguably some of his best material. In 1987, Roy Orbison was inducted into the Rock & Roll Hall of Fame. In 1989 he was inducted posthumously into the National Academy of Popular Music/Songwriters Hall of Fame. The singer was also recognized by the Rockabilly Hall of Fame and in 1991 he was posthumously awarded Grammy Award for Best Male Pop Vocal Performance.